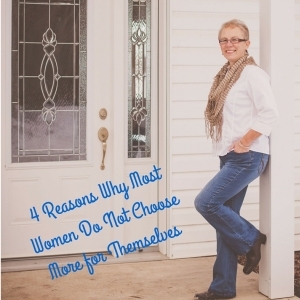 Have you ever desired to choose more for yourself? Are you at a place in your life where you desire more and you are faced with this future that is not as appealing as it once was? What you created in the past was good and now ‘What Else’? I was wondering ‘What Else?’ myself, especially when all the kids left home the ‘what else?’ got really loud. I realized I was faced with a future where I did not know what I really wanted, it was not my hubby’s job to make me happy (as I sometimes hoped), and the job after 25+ years was not the same anymore. I knew how to look after and support my family with their desires, yet what did I really want? I had to get vulnerable with myself to begin to uncover what this was for me. What would create Joy for me? What did I discover during this time…. No sense of Possibility: You are in a place of having NO CLUE as to what you would like, that you could have it, or what you desire seems like WAY TOO MUCH WORK!! What if that is where this amazing thing of asking questions comes into play? Asking you what you truly desire, asking the Universe to show you possibilities you have never considered. Looking around this amazing world of opportunities, just like shopping for a new dress, you can shop for what will bring you Joy. You can have it and it can be created with ease. Guilt: Putting yourself before others seems like a HUGE NO NO!! We are taught caring for others is what is best and anything other would be selfish. The possibility of choosing for you stops you dead in your tracks, totally paralyzing! What will others think? What if choosing for you and caring for you is exactly what others in your life would love for you and benefit from? Invisible support system: Support yourself, what the heck IS that? Ask others for help? NO WAY!!! You can’t see where the money or time would come from. Let alone everyone who will help you create this future with Joy in it when you don’t even know what to ask for! What if now is the time for you to trust that this cool Universe has your back, you could have your back, you could create resources, like money and other peeps that could support you in what it is you desire. Its TOO LATE or I can’t start now: I am over 50, or sick, or unemployed, a single mom or whatever the situation you are in…. You tell yourself you can’t start or it’s too late to start now. Whatever place you are in it is NEVER too late! What if you creating your future is what gives life to you in ways that you could never even imagine?! Writing that book at 80 that you always dreamed of, doesn’t that just excite your entire body?! What if creating your life now shifts your illness? What if being unemployed gives you the freedom to uncover you in ways you never imagined? And when is too late anyways? What if I told you that you KNOW somewhere deep inside of you what you desire and that with questions, kindness to you and vulnerability with you, you could uncover and discover the future that would bring you Joy? I have come up against all of these reasons and others too, while choosing more for me, I just didn’t allow them to stop me. How could I help you create more Joy for you and your life?